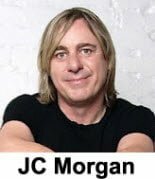 The online course is a unique, fast paced presentation of the most critical and vital step-by-step information a new comedian needs to develop a powerful stand-up comedy routine from scratch in the shortest time possible. The Killer Stand-up Online Course consists of 8 Training Modules (28 lessons) to provide an additional compact, step-by-step, actionable resource based on the information provided in the Interactive Guides. There is also information provided in this course that is not provided in the Interactive Guides. Additional information about the Online Course Training Modules can be found on the Core Content page. Overall Online Course Objective: Provide talented individuals a proven, easy to use step-by-step system for developing, structuring and professionally delivering topic based stand-up comedy material that ultimately generates headliner laughter levels (a minimum average of 18 seconds of laughter for each performing minute) in the shortest amount of time possible. This popular and comprehensive reference (over 275 print ready pages) provides unique techniques in a simple, detailed, step-by-step format for developing a stand-up comedy act based on your natural sense of humor — from scratch. As I mentioned earlier, this system is not based on traditional joke writing techniques. Instead, this guide focuses on a new methodology for rapidly producing and refining large amounts of stand-up comedy material quickly using your own unique sense of humor. This unique guide also details the step-by-step process used to create a 3 minute stand-up comedy bit from the idea phase all the way to the actual performance of the bit (performance audio provided). This extensive reference resource (over 250 print ready pages) reveals exclusive secrets, techniques and methods that show you how to conquer the greatest obstacles in stand-up comedy, enhance your performances and tighten your act in the shortest time possible. This guide gives you access to the most powerful and unique techniques and methods ever developed to help you deliver and enhance your comedy act or speaking/training presentations to their maximum potential. 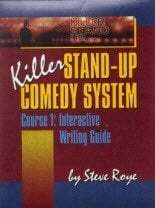 In a nutshell, the information provided in this guide can help a new comedian shave months if not years off the time it takes to become a highly skilled and proficient entertainer. Also included in this highly detailed online book – The Secret Weapon: How to conquer stage fright for good! And there are over 60 online multimedia files that supplement the Interactive Writing and Performing Guides. I don’t just tell you how — I show you every step of the way! Additional information about the Interactive Guides can be found on the Core Content page. I wanted to let you know how it is all going for me. I purchased your system about 6 months ago. I had done a stand-up comedy workshop and had been dared to enter a local comedy search competition. Having continued to refine my material and develop more using your techniques, I am now hitting a new height with PAR’s between 25 and 32 (15-19 seconds laughter per minute)!! I have much to thank you for, Steve. In addition to all the Core Course content, new Members also get immediate access to the Phone Coaching Audio Package. The Phone Coaching Audio Package is provided to augment the information provided in the Interactive Guides and the Core Training Modules and to help answer questions that you may have. 1. The Killer Stand-up Comedy System Training Audio. Initially, this 68 minute audio recording was made available almost exclusively to paid phone coaching clients and provides step-by-step details on how to develop topic based stand-up comedy material using Killer Stand-up methods and techniques included in the Interactive Guides and the Core Training Modules. 2. 5 Hours of recorded phone coaching audios. This audio package also includes 5 hours of select, in depth one-on-one phone coaching sessions that I have conducted over the last several years and have been given permission to use for educational purposes. 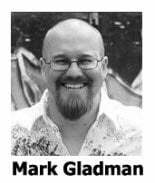 You will be hard pressed to find ANY comedy class, workshop, book or course that will give you more ACTIONABLE information for developing and delivering a professional stand-up comedy routine that gets big laughs than what is presented in the Interactive Guides, Core Course materials and the Phone Coaching Audio Package. You also need to know with confidence that you are getting the laughter results you want with your stand-up comedy material and know exactly which aspects of your stand-up comedy material need adjustments or rework for bigger laughs. Once a member has started performing as a comedian, there is no better performance benchmarking or performance evaluation tool than the Comedy Evaluator Pro online software — which was featured in the popular stand-up comedy documentary “I Am Comic”. Members may request a free 1 year extended access period to Comedy Evaluator Pro at any time beyond the initial 14 day free trial period. A free 14 day trial period is available at anytime so you can see for yourself how Comedy Evaluator Pro works. Details for requesting your 1 year free access to Comedy Evaluator Pro are provided in the Member Course Content Access Area. 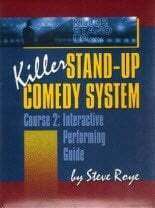 Bottom Line: The course materials made immediately available to Members upon initial registration provide all the actionable, step-by-step instruction needed to learn how to quickly and effectively develop and deliver a high level stand-up comedy routine in the shortest amount of time possible. There is also a tremendous amount of additional valuable and actionable bonus content made available to Killer Stand-up Online Course Members provided at no cost and is simply unavailable from any other resource…. Make no mistake — I want you to have the greatest success in the shortest time possible with your stand-up comedy endeavors. 8 Independent Specialty Lessons Package ($59.95 value). The Independent Lessons Package is comprised of 10 detailed specialty lessons designed to amplify and supplement the information provided in the Interactive Guides and the Core Training Modules. Note: One of the 10 lessons in this package includes a special audio lesson called Comedy And Marketing Secrets For Magicians. Corporate Comedy Secrets Training Package ($89.95 value). For those who have the ability to develop and deliver a clean and powerful stand-up comedy act, this audio training package demonstrates how to break into and progress in the potentially lucrative corporate comedy marketplace. Additional details about the content included in this free upgrade can be found on the Advanced Content page. If the Killer Stand-up Online Course cannot help you meet your stand-up comedy material development goals and beyond, there is no other system on earth that can help you do it. Period. And because of the measurable results most talented members are able to achieve as a result of using and applying the techniques and strategies in the course, refunds for the Killer Stand-up Online Course are rare. However on occasion, there are individuals who will enroll in the course with great enthusiasm only to painfully discover that they don’t actually have the baseline comedy talent or skill needed to develop and deliver high level stand-up comedy material. And make no mistake — I am fully aware of just how deeply disappointing that realization can be. Subsequently, I offer a 30 day no hassle money back guarantee– no questions are asked and no explanations are required. Your course is right on the money! I’ve always considered myself a good writer, but your course takes writing and performing to the level of connecting to an audience. That’s a big deal. It’s the difference between doing a good set and “owning the room”. I can’t thank you enough! I also want you to have confidence that the secrets, strategies, techniques and tools I have to offer will truly help you reach your stand-up comedy dreams and goals. 1. Please make sure you have thoroughly reviewed the free demo lessons and Interactive Guide chapters. 2. 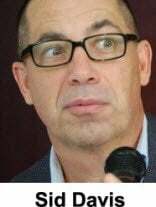 Find out a little bit about me (Steve Roye) and what qualifies me to provide higher level in stand-up comedy education. 3. Contact some of the individuals featured in the Success Stories section or on the Testimonials section and ask them questions about the value of the information I have to offer in the Killer Stand-up Online Course. 4. Try using the conventional “joke writing” methods every other so-called stand-up comedy “expert” teaches for 6-12 months. 5. If available in your area, enroll in a live stand-up course or workshop. See if that helps you in any way develop and deliver high impact stand-up comedy material quickly. As far as I can tell, I am one of the only stand-up comedy experts on the planet who will tell you to seek out and try out what every other so-called “expert” has to offer in the way of stand-up comedy education FIRST. The registration process to gain lifetime access to the Killer Stand-up Online Course is simple, straightforward and can usually be completed in less than 5 minutes. 1. Using on of the buttons below, your registration payment using your credit card or PayPal will be securely processed for $349.95 just $119.95 (limited time*). 2. Once your registration payment has been processed, you will be redirected to a special Member Registration page to establish your secure Member account for the course. You will need to be prepared to provide these information items when you get to that special Member Registration page: username desired, the password you want to use and the email address you want to associate with your account in order to retrieve your username and/or password should you forget it. You will get two important emails for your records: a payment receipt email and a registration welcome email with the username and password for your Member account. Your registration will be processed directly on this secure website via the most protected and secure processing gateway available. I truly wish you the best in your stand-up comedy adventures! 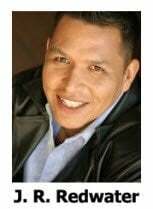 I am one of the Native American comedians featured in the American Indian Comedy Slam on the Showtime Network. I wanted to let you know that I started with the Killer Stand-up Comedy System 5 1/2 years ago. I have enjoyed an amazing and lucrative stand-up comedy career in record time as a direct result of your course. I just cannot thank you enough. Thank you for choosing the Killer Stand-up Online Course!